In part one of this two part series, I reviewed the Japanese Kit Kat flavors of Noir and Wine. 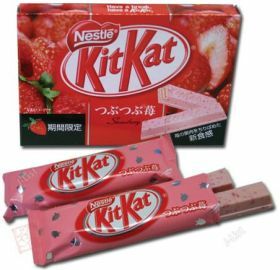 Today I am reviewing some more Japanese Kit Kat flavors: Strawberry and White Maple Syrup. I’m still amazed the candy companies produce different flavors in different countries. Both of these flavors came in boxes of 4 sticks wrapped in 2 packs of 2 each. The size of the Kit Kat sticks are the same size as their U.S. counterpart. Upon opening the package, all I could think of was Strawberry Quik – it smelled just like Quik! One of the big selling points of this flavor is that it has strawberry bits in and it truly was loaded with strawberry bits. It looks like they took white chocolate and mixed in real strawberries. The filling between the Kit Kat bars was also starwberry (pink). Overall it tasted really good and was very strawberry-y, though it was a touch too sweet for me. This one is an odd one. I wasn’t exactly sure what to expect from this. It is essentially a Kit Kat with white chocolate and a touch of maple syrup (wait – isn’t that what the label said?). The maple syrup flavor was faint – just enough – and wasn’t overpowering at all. Again, I thought it was just a bit too sweet for me. I think I just don’t care for white chocolate much and that’s probably why I thought it was good, but not great. 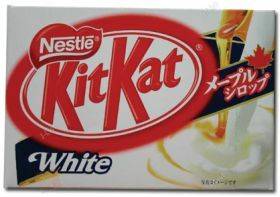 The Kit Kat White Maple Syrup flavor is a limited edition so it may disappear at any time. I just love this idea, omg it is soooooooooooo lame! :( it’s awful! I mean come on if you were gonna make a site you should have made a site about naruto or inuyasha!LOL im just kidding, i luv this, nice site! Jbox doesnt have kitkats! I would like to know where I can buy from japan and get it shipped ot the USA please.